LCG Jukebox for Windows Mobile is a music player for mobile devices that is designed to suit all your music listening desires. It offers excellent sound quality, comfortable playlist management, easy music selection, equalizer, Internet streaming, and more, High-quality stereo playback, MP3, AAC*, FLAC and OGG music formats, Includes free SHOUTcast Internet radio directory, The sleep timer letting you to fall asleep with your music, etc. 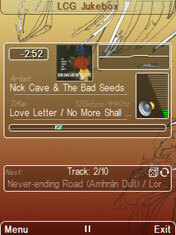 LCG Jukebox for Windows Mobile is a music player for mobile phone. LCG Jukebox can also search song lyrics or download Album art from the Internet. Player is developed for smartphone pocket PC - Symbian and Android. Qweas is providing links to LCG Jukebox for Windows Mobile 2.72 as a courtesy, and makes no representations regarding LCG Jukebox for Windows Mobile or any other applications or any information related thereto. Any questions, complaints or claims regarding this application LCG Jukebox for Windows Mobile 2.72 must be directed to the appropriate software vendor. You may click the publisher link of LCG Jukebox for Windows Mobile on the top of this page to get more details about the vendor.